Allied Drain Cleaning is Connecticut and MA’s Number 1 company when it comes to water line repair! Your water lines may need repairing if you see moisture on ceilings, floors, or walls. Leaking pipes, valves, or connectors are the main causes of a failure. Water flows quickly when you turn on your faucet when working properly. If you see that the water is not flowing as rapidly, there may a problem with the water pressure. If so, a slow leak is somewhere in the water line. Corrosion: Water lines inside and outside of your property are designed to last for years. However, over time they experience extensive corrosion and need to be replaced. Corrosion can result in pipe leaks that can significantly damage your floors and walls. Fire or flood damage: If a fire or flood has occurred, the water lines may have incurred major damage. You may need to replace your pipes if your experienced such a catastrophe. Incorrect installation: Sometimes water lines have been installed incorrectly. This has led to water pressure problems. 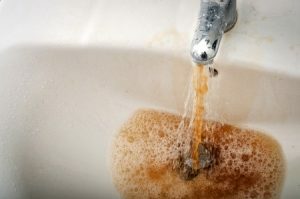 Strange odor or color in water: Do you notice a foul stench or abnormal color in your water? This may indicate failing water lines. We advise a complete water line replacement. It’s the best strategy to keep you and your family healthy. Your safety and comfort are our top priority. We will make sure every main water line repair or replacement meets local safety and health code regulations. We arrive promptly, ready to work. We’ll diagnose the problem in your water lines and pipes located inside your house and underground. Our goal is to avoid major excavations that would otherwise cost you time and money. If there is a problem with your main water line and you need to have it inspected, contact Allied Drain Cleaning at (860)798-8200. We provide honest, detailed evaluations with your safety in mind.